It’s Over. Now START. | Less. More. Abundantly. I have in my possession the scariest book I have ever beheld. I left it in the smiley amazon box for three days on the washer; because to open it was to acknowledge a reality in my life. I had an epiphany, a revelation, a ‘what-the-what?’, a moment of inspiration, a whisper from the heart of God, the results of more than 4 hours sleep in a row-an idea. I keep failing at my goals because I keep starting over. I’m finished before I start. By always starting over I completely discount that I have lived and learned. I have been scarred and scorned. I have been harmed and healed. My feet are calloused from walking around these mountains. My forehead is bruised from bumping into the walls of the canyons. I can’t start over any more than I can go again into my Mother’s womb and be born. What I can do is start; right where I am. Scars and all. I can start. To be honest, I am terrified. The book which started it all (pun intended)? What drew me, besides divine intervention to get on with it already, was the author’s profligate use of the word ‘awesome’. I love awesome. I love awesomesauce. I use awesome unashamedly. I want to move from average to awesome. I can’t unless I start. There is no magic formula. No pill or meditation to repeat. I simply must start. How will I start? By doing something. For tonight, it meant writing this blog. Tomorrow? Who knows what I will start. One thing I know is it will be something. It’s over, this lie of trying to go back and fix and fiddle and make up for and fill the crevices and do it ‘right this time’. It’s over. Now I can start. What will you do to start? What’s the one thing which terrifies you the most, but you feel your spirit whispering you need to do? 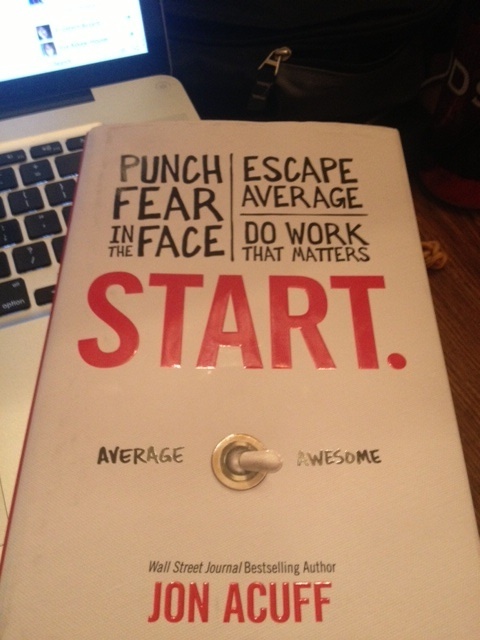 Want to have a reading group around the book, “Start” by Jon Acuff? Let me know. Accountability is something I am starting too and would love to share this part of the journey with you. I read his book Quitter and it was very good…I am sure this one will be too! Current life needs mean I can’t join your book club – I hope others will! Hugs to you RE friend! Sounds awesome! 🙂 I’m going to download the first chapter for free. I’ve never heard of this book before, but it sounds ‘awesome’ 🙂 Any title that has ‘Punch fear in the face’ is bound to be amazing, right? I love your beautiful sight, KimRo! I can’t wait to read more!